Anyone wanting to use these advantages, needs head pots that are appropriate to the size of the induction hob. Using too small pots leads to wastage. The bottom of the pot should be flat and consist of magnetizable iron. Vessels of aluminum, copper, glass, ceramic and stainless steel do not work properly. Sensitive individuals may interfere on the fan noise, which is necessary to cool the electronic control system. Conventional electric cooking and baking stoves work with household current with a frequency of 50 Hertz (Hz). Here too close to the furnace magnetic fields can arise. Particularly in the baking area of fields from 1,200 nano Tesla (nT) were measured at intervals of 10 cm. For induction cookers with a magnet coil, an electromagnetic field is generated and converted by contact with the magnetizable saucepan into heat. The magnetic coil produces fields in a frequency range between 20 and 50 kilohertz! So in a thousand times higher frequency range than conventional burners. Here it is worth noting that the health relevance of higher frequency fields has been studied even less than health burden in the 50-Hz range. The 26th Bundesimmissionschutzverordnung (legal regulation in Germany) sees at 50 Hz before a limit value of 100.000 nT and at a frequency of 800 hertz up a limit of 6.250 nT. This is offset by lower precautionary values by other institutions. The Nova Institute published in 2002 a precautionary value of 200 nT at 50 hertz and 12.5 nT above 800 Hz plus a linear safety factor for frequencies up to 150 kilohertz. Mentioned in the report of the Nova Institute were measured at induction cooktops in the space of 10 centimeters 1800 nT, at 20 cm 140 nT and at 30 cm 35 nT. 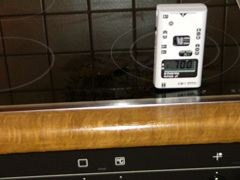 By keeping distance from the cooktop, the magnetic field exposure can be significantly reduced. The duration of stay in the range of 10 centimeters is exigently to avoid, especially for pregnant women and children. Manufacturers recommend persons with pacemakers to keep at least 40 cm away from the induction hob.